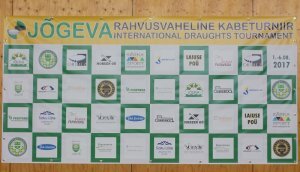 International competition in draughts-64 “Jogeva-2017” is held from 1 August to 6 August 2017 in Jogeva, Estonia. International grandmaster Andrius Kybartas (Lithuania) won Rapid program, which took place August 1, 2017. International grandmaster Ion Dosca (Moldova) won main tournament. 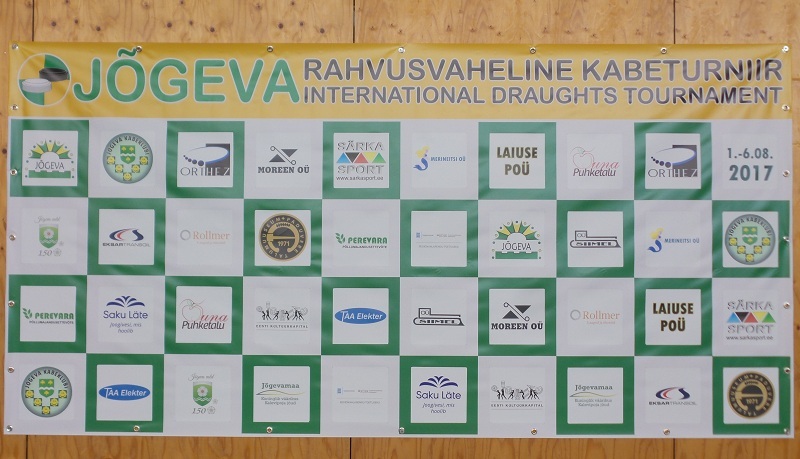 Competition is held for promotion and development of draughts-64, implementation of IDF international titles, strengthening the friendly relations between draughts players of the countries – member of IDF. 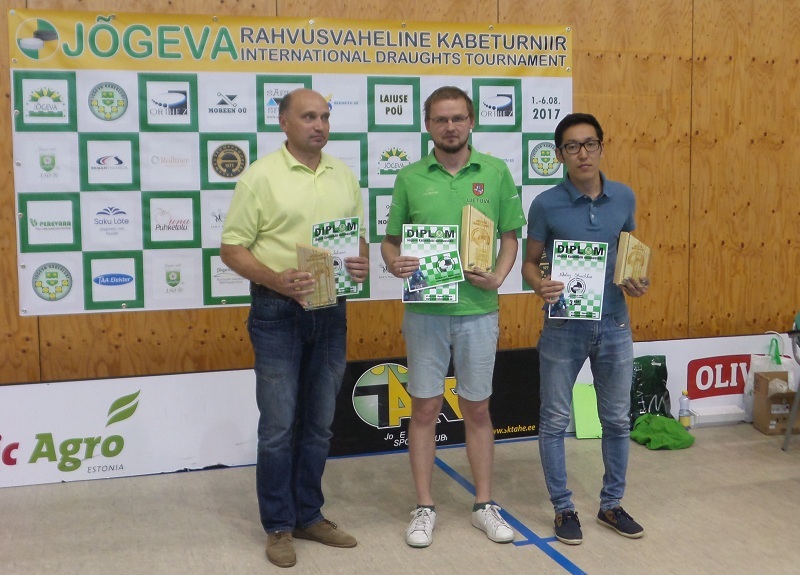 Tournament is organized and conducted Jogeva Draughts Club. Tournament is held from 1st August to 6th August 2017 in Jogeva, Estonia. Venue: Jõgeva Sport Center “Vitrus” (Aya str. 40, Jogeva, Estonia). Rapid is held 1st August, opening at 11.00. Main tournament is held from 2 to 6 August. Opening is 2nd August at 10.00, closing 6th August at 14.00. Players, who declared until 9th July, are allowed participate. For declared players: Rapid – 5 EUR, main tournament – 10 EUR. Grandmasters play without entry fee. Or, by agreement, may be paid to the credentials committee. Applications must be sent until 9th July 2017 to email: [email protected]; [email protected], tel. +372 5058239 (Ülar Poom), or by post: Pargi str. 18-2, 48303 Yogeva, Republic of Estonia, Uno Plakk. All expenses for travel, meals and accommodation are paid by participants or sending organizations. There are held two overall tournaments in draughts-64 for men and women: Rapid and main tournament. Rapid is held by Swiss system in 7 rounds with the draw of the initial moves and positions. Competitions are held on the system of micro-matches from two games. The time control is 10’ to the end of the game + 2” per move for each participant in both games of micro-match. Main tournament is held by Swiss system in 8 rounds with the draw of the initial moves and positions. Competitions are held on the system of micro-matches from two games. The time control is 45’ to the end of the game + 30” per move for each participant in both games of micro-match. Places of participants are determined in the overall standings, among women, players with rating below 2350 (EDF) or 2100 (IDF) and among veterans (60+). Determination of places and technical issues of the tournament will be fixed in the regulations before the start of the tournament on the spot. The prize fund of main tournament is 1250 EUR. Winners awarded also diplomas and non-cash prizes. All not specified in these rules and regulations of the tournament positions provides by main arbiter and the Board of Jogeva Draughts Club. 06-08-2017 International grandmaster Ion Dosca (Moldova) won in the last round Estonian grandmaster Arno Uutma and won the traditional international tournament in draughts-64 “Jõgeva-2017”. International grandmaster Guntis Valneris (Latvia) took second place. On the third position of the standings is Andrius Kybartas (Lithuania), ahead by the coefficient of Andrey Kalachnikov (Russia). Antra Valneré (Latvia) is the best among women. Photo from closing ceremony published. 05-08-2017 International grandmaster Ion Dosca (Moldova) sensationally won in the 8th round the current European champion Nikolay Struchkov (Russia). With the result of 11 points he is single leader before the last round. 10 points have Andrius Kibartas (Lithuania) and Guntis Valneris (Latvia). 9 points have 6 participants. On August 3 and 4, a large cultural program with fascinating sports competitions and visiting of the famous Peipsi lake was organized for the participants of tournament. See photo. 02-08-2017 Closing of Rapid program was held today. Main tournament started. See current results. 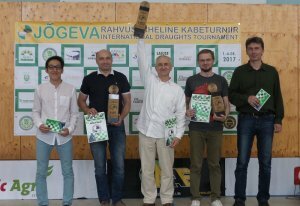 07-04-2017 International competition in draughts-64 “Jogeva-2017” will be held from 1 August to 6 August 2017 in Jogeva, Estonia. Regulations published.